When To Introduce Meat To Baby? What Kind Of Meat Should You Begin With? How To Process Meat For Baby Food? 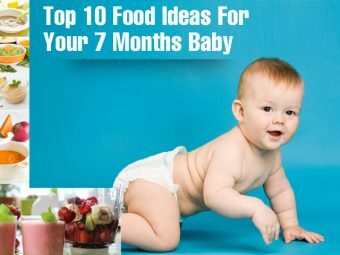 Now that your baby is six months old, it is time to go beyond exclusive breastfeeding and introduce some pureed solid food in his/her diet. While fruits and vegetables are going to be the number one choice, most mothers do spare a thought for meat as well. This is when the predicament begins. Can meat be a part of the baby’s first solid food? 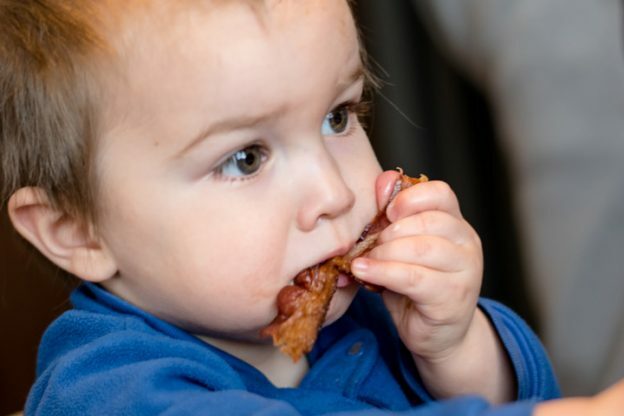 When can a baby start eating meat? Which meat is safe to start with? If these questions are on your mind, then this MomJunction post would address these queries. In this article, we will tell you when you can introduce meat in your baby’s diet and how your baby can benefit from eating that food. We also share some amazing baby food recipes made from meat. So read on to learn all about meat in your baby’s diet. You can introduce meat to your baby’s diet between 6-8 months of age (1). 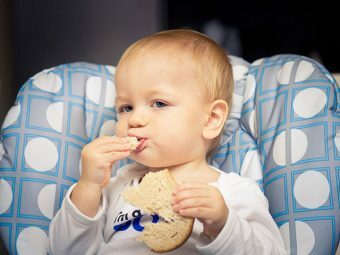 when you will gradually introduce the baby to solid foods. There is no restriction on the kind of meat you should introduce to your baby. Be it cattle (which is red meat), poultry or fish meat, you can make your choice and start with two servings of about one to two teaspoons pureed meat a day. Iron and zinc are among the most important microminerals that your baby needs from the age of six to 12 months. As breastmilk is not a very good source of iron, with the baby growing, the requirement for iron with good bioavailability increases. Meat is an excellent source of these vital nutrients (2). In fact, zinc and iron from meat are quite readily absorbed by the baby’s body (3). Along with that, meat is also a source of other microminerals such as copper and manganese. Meat contains more nutrients than fruits or cereals of the same quantity (4). 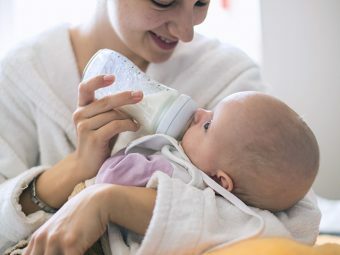 This means your baby gets sufficient nutrients from a small portion of meat, also it has a higher satiety value and keeps the baby fuller for longer, which implies you will have to feed him less often. Meat is not just a great source of iron but also enhances the absorption of iron from other food sources (5). For example, feeding a meat-vegetable puree can double the iron absorption, thus preventing anemia. Non-vegetarian food has a vitamin content especially vitamin B-complex. In fact, animal proteins, such as chicken, egg, fish and dairy are an excellent source of high quality vitamin B12. Vitamin B12 is important for the maintenance of healthy nerve cells in the body. It also works with vitamin B9; folic acid to play an essential role in the formation of red blood cells (RBCs) (6). 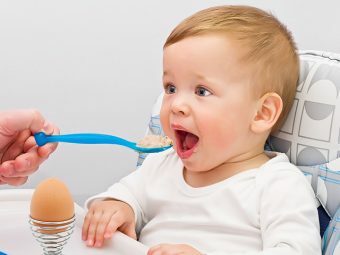 Deficiency of vitamin B12 in babies, along with anemia can cause delayed or even retarded motor skills due to its impact on brain development (7). Protein found in meat is of higher quality and has a higher bioavailability than plant proteins. This means your baby’s body will be able to utilize more protein from meat than it does from the same quantity of plant-based protein. Now, we know you are convinced about feeding meat to your baby. But when preparing to introduce meat to baby, it needs a certain process. Meat must always be cooked and pureed before feeding it to the baby. You must ensure that there are no clumps of solid meat in the puree. Also, you should never feed bits of solid meat, even if it is boiled. You may give him tiny bits when the little one has ample teeth and when he is eating other solid foods. Buy boneless meat from a trusted source: Purchase conventional or organic boneless meat (poultry, cattle or fish). Organic meat is sourced from animals that have not been treated with antibiotics or any other drugs. Organic foods reduce the chances of a baby’s exposure to harmful chemical. It is best to buy boneless as the chances of choking are very less. Also make sure that the meat is fresh and not stale, otherwise it can cause serious stomach issues to the baby. Clean the meat: Make sure you clean the meat very well to prevent the presence of salmonella bacteria, also it is advised to trim the fat for better digestion as animal fat can be heavy for the baby to digest. Soften the meat: You may pound the meat using a pounder or just roll it with a rolling pin. This will make it tender and thinner making it easier and quicker to cook. You may choose to skip this step and cook the meat directly. Since you have to make a puree, it is best to cookboil the meat in a pressure cooker. It ensures maximum tenderness; also the high pressure and temperature kills most of the harmful bacteria. Note that the meat stock i.e. the water in which the meat is boiled should be used in the puree as meat stock is rich in nutrients, particularly water soluble vitamins i.e all the B complex vitamins like thiamine, folic acid, riboflavin etc in this case. Therefore, do not throw it away but use it in the puree. Also, as babies above six months of age can have water you need not worry about him having the meat stock (8). Baking is another way of cooking meat. Since baking does not require any water, nutrients do not leach out of the meat. If you choose to bake, then you will have to add water separately while making the puree. Cook or bake the meat till it is very soft and tender. Once done, transfer the meat to a blender. Add some boiled water or add the meat stock (if the meat is boiled). Blend to the desired consistency. Add some water if you want thin puree and your meat puree is done. Do not add any condiments or salt to it. Feed it plain, instead. However, you don’t have to bore your baby with a monotonous pureed meat every day. Try various recipes to make it interesting for the latest food explorer in your family. A simple and easy way to increase the nutritional value of any fruit puree is to blend some meat puree with it. You can also add some slices of fruit when blending the meat for meat puree. This will give a fruity flavour. The process is the same as making the meat-fruit puree. Unlike fruits, do not add vegetables raw when blending the meat since vegetables are richer in fiber than fruits are. Fibrous vegetable strands may form clumps in the puree and pose a choking hazard. Therefore, always cook the vegetable till soft before adding it in the meat puree. Cut the baked or boiled potato into small pieces and add them to the meat puree. Add the milk and cook them together for 7-10 minutes on a low flame. Once done, let the mixture cool. Then, pour the mixture into a blender and blend to the desired consistency. Add some freshly boiled water to thin the mixture, if desired. Blend till the puree is thin enough for the baby to eat. This easy and simple meat recipe suits your baby once he gets his molars and he is capable of chewing. Start by mashing the boiled potatoes till they are soft and chewy. Take the boiled/baked meat and pound it till it breaks into tiny pieces. You can also use a blender to coarsely mince the meat into thinner strands. Add the meat to the mashed potatoes and mix them well. You can add some milk to achieve the desired consistency. You can even use mashed peas in place of potatoes or use it as an additional ingredient. This baby food recipe is great for baby’s lunch or dinner time. Start by preheating the oven to 350 degrees F (175 degrees C). In the meantime, mix the ground meat, egg, milk and dried bread crumbs. You can also use some baby cereal here. Place the mixture on a lightly greased tray and bake it for an hour. Once done, let the meatloaf cool. Break it into small pieces or mash it along with some milk to soften it. You can even make small balls out of the batter before baking, to give it a meatball look. Your baby will enjoy the unique taste and flavor of this meat baby food preparation. These recipes are easy to make for you and nutritious to eat for your baby. However, you need to take care of a few things when giving meat to the little one. Here are certain points that you need to keep in mind before and while feeding meat to babies. Just like any other solid food, even meat poses a risk of allergy to the baby. Meat is rich in protein, and a baby’s developing immune system may mistake it to be a foreign pathogen and mount an attack. Therefore, look out for any allergic outbreak symptoms such as skins hives, diarrhea, and swelling in lips and face. Allergies are the reason why you must start feeding meat in small quantities initially so that you can observe the onset of any reaction. If the meat seems to be suiting your baby, then slowly increase the quantity. Some medical practitioners recommend parents to wait until the first birthday to introduce meat for the immune system to develop. But there is no evidence to suggest that it reduces the chances of allergy. 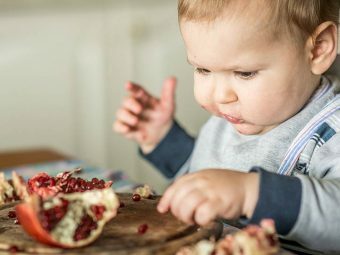 In fact, research has shown that introducing food early in a baby’s life may diminish the probability of an allergic reaction (9). Adults consume various forms of meat, which are not necessarily safe for the babies. For example, you should avoid processed and salted meats sold at supermarkets or delis since they are heavily processed to have a longer shelf life. However, when it comes to the type of meat itself (chicken, fish, goat, etc.,), there is no restriction on which meat to introduce as long as you do it in small quantities. That way it is easier to determine if your baby is allergic to a specific type of meat. Meat-based baby food preparations can be frozen to be reheated and fed later. But avoid storing it for over a day to prevent any bacterial growth and contamination. Store the meat puree in a freezer-safe container and before reheating the puree, let it thaw in some warm water. Never freeze thawed puree again since it may lead to an unpleasant taste due to bacterial activity. You may come across packaged meat-based foods specially made for babies. This could be plain packaged meat or meat made into a preparation like chicken gravy. While these are formulated for young ones, they can never match the safety of fresh meat. The primary reason is the fact that this meat is packaged and manufacturers may add high quantities of sodium as a preservative. Also the problem with packed meat is the chances of the presence of BPA i.e. bisphenol a chemical used to treat plastic that can cause hormonal damage in the babies and even adults. If you want to be safe and benefit the most from meat, then stick to fresh meat prepared at home. Remember, meat is a great source of nutrients and even makes an excellent finger food when your baby is completely weaned. However, start with small quantities so that you need not have to worry about allergic reactions in your baby. Keep a close watch and see a doctor if you think there are any signs of allergy. Also, do not introduce meat with some other new food. One new food at a time is the best way forward. Do you have unique meat recipes for babies? Do tell us by leaving a comment below.